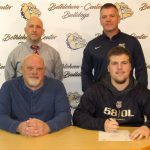 Bethlehem-Center High School senior Anthony Herman has signed a letter of intent to play football at Marietta College in Marietta, Ohio. Pictured below (front row from left) are Mr. George Herman and Anthony Herman in addition to (back row from left) Mr. Aaron Cornell, high school principal, and Mr. Joe Kuhns, head football coach. Join the US on Friday, October 27, 2017 for the last game of the regular season to honor the senior football, band, majorette, and color guard members. Friday, September 1, 2017 7:00 PM Yough Senior High School AWAY 6 Bethlehem-Center Senior High School HOME 21 Game Recap . Boys Junior Varsity Football, Boys Varsity Football · Aug 31 HELP OUT HURRICANE HARVEY VICTIMS! On Friday, 1 September 2017, donations will be collected at the BC vs. Yough game to support the relief efforts in Texas. Please if you can make even the smallest donation it can make a big impact. Thank you! Friday, August 25, 2017 7:00 PM Bethlehem-Center Senior High School AWAY 32 STO ROX HOME 26 Game Recap . Boys Junior Varsity Football, Boys Varsity Football · Jul 14 VOTES NEEDED FOR 2 BC FOOTBALL PLAYERS! Fall sports physicals are available. All students interested in playing a fall sport must sign up in the nurse’s office. Physicals will be held in the middle school July 12, August 2 and August 9 from 8:30-11:30 AM.